After years of playing in various projects, I wanted to release a recording under my own name that highlighted a lot of music that hasn't been documented before. My playing on fretted and fretless guitars draws from a wide range of western and non-western music, but improvisation is always a core component at the heart of my process. It's attractive to me as a performer because there's a real immediacy in giving a voice to something that can only exist in that moment. It's a kind of mindfulness that's communal with the audience and it can create a truly special moment of resonance and transcendence. 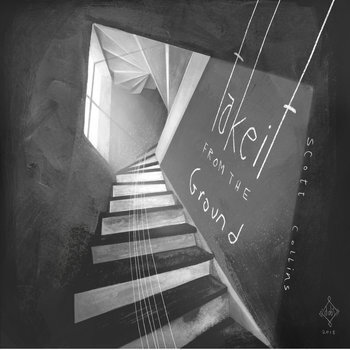 The title of the CD, 'take it from the ground', was really an acknowledgement of the recording process. All of the tunes (except the last song) were improvised and recorded as it was performed. The title is about capturing and preserving what happened in a specific room in a specific moment in time. The result is almost an anti-acoustic or post-acoustic recording, that is more about exploring a philosophical mindset than merely showcasing technical skill. Some of these pieces were really challenging to pull off live, but it's more about serving the song and the mood instead of saying, "Look at what I can do!" There's a certain amount of that in any CD release with craving attention, but with this recording, I wanted to create something unique, an immersive environment that transports people somewhere and gets them thinking about the music after it's done playing." I have to give full credit to Daby Zainab Faidhi with altering the musical direction of the CD. I met her through an international film festival where she had submitted a fantastic animated film called,Ardh Al-Sawad (The Black Land) and approached her about the artwork for the recording. She and I talked through a number of ideas and processes and ultimately she came up with the idea of using a set of stairs as guitar frets and then running strings down them. The starkness of the image really moved me. I had recorded a number of tracks previously, but I felt like much of the music didn't really work with the new artwork, so I saved a few of the live tracks from the previous sessions and then took the recording in a different direction." A return to an old process yielded surprising results. I had a few freeware applications on an older Mac computer that allowed me to record multiple layers of guitars and mix them in real time to a stereo file. 'In that late hour' was the first track that was done that way and '21st century blues' was the second. Like the previous tracks, those were improvised and recorded in real-time and that just set the aesthetic for the rest of the recording. 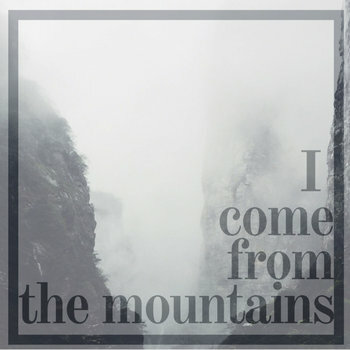 I come from the mountains is an acoustic instrumental duo consisting of Scott Collins on fretted and fretless guitar, and Dean Mirabito on tabla and Middle Eastern percussion. The group brings meditative and cerebral elements to their captivating fusion of Eastern Silk-Road sounds and Western improvisation. I Come From The Mountains as a name, comes from the English translation of the Icelandic phrase, "Ég kem alveg af fjöllum." which means, "I have no idea what you're saying / what's going on." Look for new releases later this year! Currently out in the world: (Spotify, iTunes, Amazon, etc. unless otherwise noted). Soulsha is a party, a revolution, and an adventure through different traditions. It brings together some of Boston’s top musicians in Scottish, West African, and funk music to create a sound you won’t find anywhere else on the planet. Embe Esti is New York Capitol-Region premier intercontinental fusion band that mixes Afrobeat, North African and other global traditions with Rock, Funk and Blues. Their songs combine message-based lyrics with the raw improvisation of Jazz and polished writing and performances to create original soulful dance music that will get your hands clapping and feet moving. Earth Circles UUSS celebrate the Persian New Year; Nowruz to welcome spring in a beautiful place, with wonderful friends. The ceremony is around one hour in length, and it includes a symbolic act to become familiar with Char-shanbeh soori (Iranian Fire Jumping Festival), storytelling (a Persian romance legend about Winter lady and Father Spring) by Barbara Chepaitis, Eric & Dawn Marczak, Poetry in Farsi for meditation, Music ( By " I Come From The Mountains" Scott Collins & Deen Mirabito, Musicians), and of course a few samples of Iranian food, Shirini & tea for refreshments! PS. FULL MOON DRUM CIRCLE follows the Nowruz ceremony @7 PM for those interested, All are welcome! A great bill at Pauly's with some cool bands from the Utica / Rome region! On Sunday January 27th, I Come From The Mountains brings their acoustic instrumental global fusion back to the Troy location of Tara Kitchen from 6 - 7:30! Featuring Dino Mirabito on tabla and middle eastern percussion and Scott Collins on fretted and fretless guitars. The group brings meditative and cerebral elements to their captivating fusion of Eastern Silk-Road influenced sounds and Western improvisation. With a great night of music and the always great food and drinks at Tara Kitchen it's going to be a unique, fun and memorable evening! We're really excited to be debuting a lot of new material here and we look forward to seeing you there! On Sunday, November 18th guitarist and songwriter Scott Collins showcases some of the skills that have made him a session player on television shows like the Powerpuff girls and video games like “Trials Evolution” and “God of War II” with a CD release party for his debut instrumental acoustic guitar recording, “take it from the ground” at MOPCO Improv Theatre on 10 N. Jay Street in Schenectady. The Berklee College of Music and California Institute of the Arts graduate’s playing on fretted and fretless guitars draws from a wide range of western and non-western music. In addition to performing some solo acoustic music, he’ll also be performing with the global fusion groups, I Come from the Mountains and Embe Esti. I come from the mountains is an acoustic instrumental duo consisting of fretted and fretless guitar, tabla and Middle Eastern percussion. The group brings meditative and cerebral elements to their fusion of captivating Eastern Silk-Road sounds and Western improvisation. Embe Esti is an intercontinental band that incorporates Afrobeat, North African and other global traditions into an electrifying take on soulful dance music. From Mali to Manhattan, their funky, global and eclectic music channels lively intuitive energy to the people on the dance floor. Don’t miss out on this unique opportunity to see and hear some fantastic music performed in an intimate setting that you won’t hear anywhere else! The Dylan Hartigan Project from The Voice #TeamKelly can't wait to make their Albany debut on Thursday 11/15 at Pauly's Hotel with special guests Embe Esti. The Dylan Hartigan Project is a Jersey-based indie folk rock band started by singer songwriter Dylan Hartigan in his basement. Two things drive this band: turning jams into killer songs, and friendship (cue the flowers). Their sound is inspired by Nick Drake, The Allman Brothers Band, Grateful Dead, The Stones, Velvet Underground, Oasis, Ryan Adams, and a ton of other artists and bands. In other news: Dylan was a finalist on Season 14 of NBC's The Voice with the infamous Kelly Clarkson and Blake Shelton as his coaches, adding to his repertoire of acting and performance gigs he's had since the age of three. DHP has been playing to full houses in the tri-state NYC area and can't wait to bring their sound to Albany. Embe Esti is a Capitol Region intercontinental band that incorporates Afrobeat, North African and other global traditions into an electrifying take on soulful dance music. From Mali to Manhattan, their funky, global and eclectic music channels lively intuitive energy to the people on the dance floor. On Thursday September 20th, I Come From The Mountains brings their acoustic instrumental global fusion to the Troy location of Tara Kitchen from 5 - 6:30! Featuring Dino Mirabito on tabla and middle eastern percussion and Scott Collins on guitars, fretless guitar and baglama saz. The group brings meditative and cerebral elements to their captivating fusion of Eastern Silk-Road influenced sounds and Western improvisation. With a great night of music and the always great food and drinks at Tara Kitchen it's going to be a unique, fun and memorable evening! We're really excited to be debuting a lot of new material here and we look forward to seeing you there! 7/12/18 – Parish Public House – Parish Public House 388 Broadway Albany, NY – with Binger (from Burlington, VT) and Berk Star (from Troy, NY). 6/23/18 – The Star Theater – 44 Main Street Cherry Valley, NY – As part of the Cherry Valley Artworks (CVA) summer series! Details as they come in! The Bentmen -- the legendary Boston ensemble known for apocalyptic live shows that unleash a sonic and visual mashup of tribal alt-rock and theatrical performance art -- reunite for their first full performance in 11 years at Somerville’s Once Ballroom on Feb. 9. Co-founded by frontman William “Des” Desmond in 1984, the enigmatic group wreaked havoc across the local music scene into the ’90s and ’00s, playing venues from Chet’s Last Call to the Institute of Contemporary Art -- and leaving tens of thousands at the Mass-Cann Freedom Rally on Boston Common dazed and confused by the band’s provocative presentation. The group last appeared onstage for a stripped-down 2014 set at the Brighton Music Hall, joining such other reuniting bands as the Flies, Men & Volts and Anastasia Screamed in one of several shows that celebrated college radio station WMBR’s Pipeline! At 25: 50 Years of Boston Rock. Bentmen progeny Casey Desmond will open the Once show, sharing the stage with her parents for the first time. Casey has recorded with bassist Tony Levin (Peter Gabriel, King Crimson) and performed for 14 million viewers on the inaugural season of NBC's “The Voice.” Her newest project, CMB, explores the darker side of electronica with a wall of lush grooves and hypnotic vocals. Scott & Dean Perform as part of the Music at Noon series at Troy Music Hall.